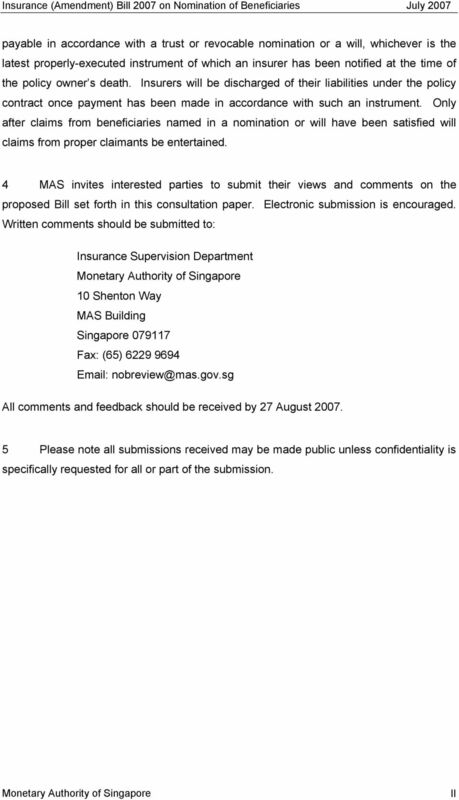 Download "CONSULTATION PAPER P006-2007 July 2007. 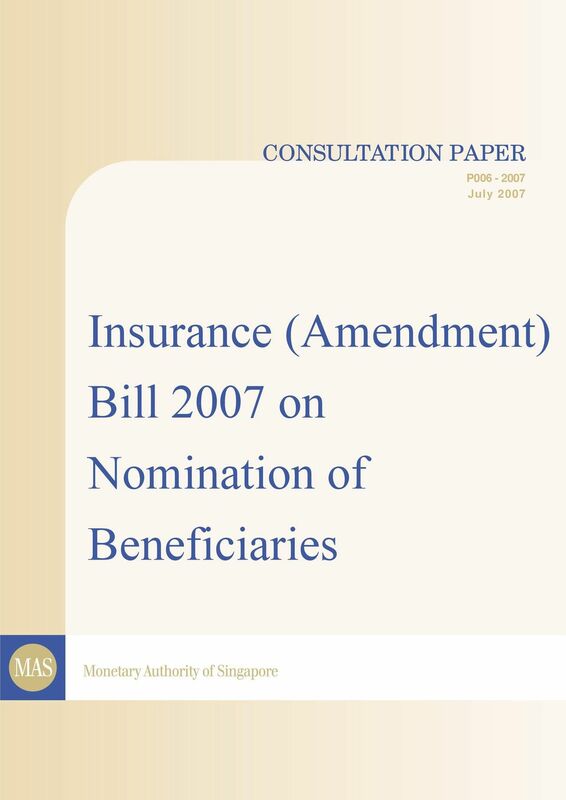 Insurance (Amendment) Bill 2007 on Nomination of Beneficiaries"
5 Short title and commencement 2 1. This Act may be cited as the Insurance (Amendment) Act 07 and shall come into operation on such date as the Minister may, by notification in the Gazette, appoint. 5 New Part IIIC 2. 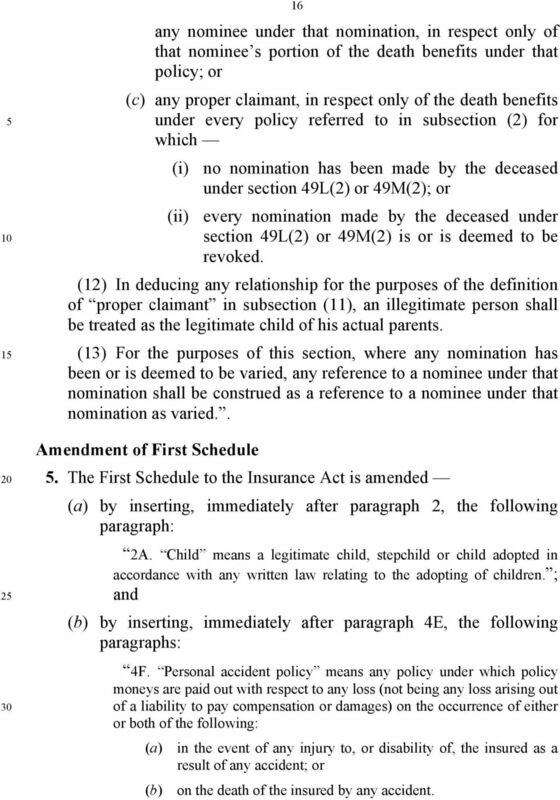 The Insurance Act is amended by inserting, immediately after section 49J, the following Part: PART IIIC NOMINATION OF BENEFICIARIES Interpretation of this Part 49K. 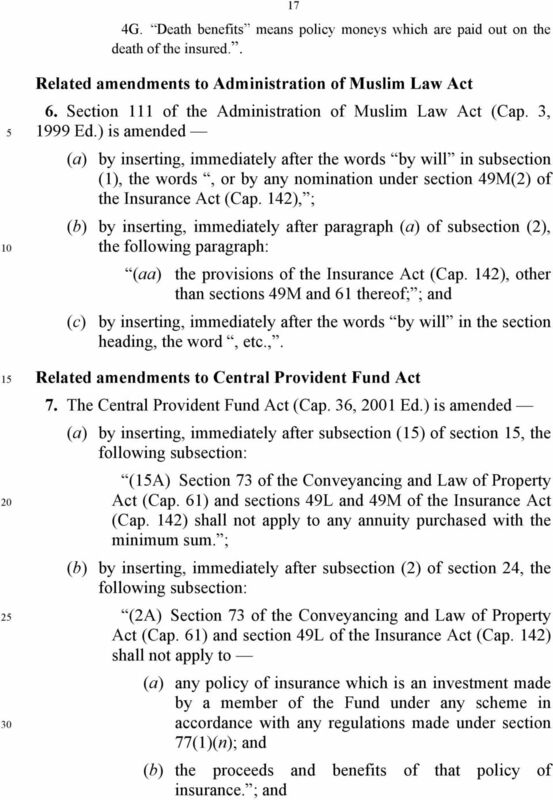 In this Part, unless the context otherwise requires Central Provident Fund means the Central Provident Fund established under section 6 of the Central Provident Fund Act (Cap. 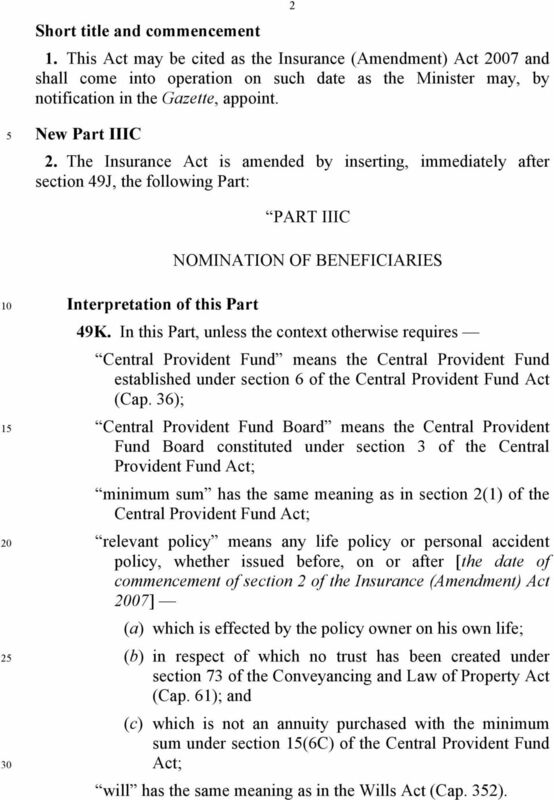 36); Central Provident Fund Board means the Central Provident Fund Board constituted under section 3 of the Central Provident Fund Act; minimum sum has the same meaning as in section 2(1) of the Central Provident Fund Act; relevant policy means any life policy or personal accident policy, whether issued before, on or after [the date of commencement of section 2 of the Insurance (Amendment) Act 07] (a) which is effected by the policy owner on his own life; (b) in respect of which no trust has been created under section 73 of the Conveyancing and Law of Property Act (Cap. 61); and (c) which is not an annuity purchased with the minimum sum under section (6C) of the Central Provident Fund Act; will has the same meaning as in the Wills Act (Cap. 352). 6 Trust nomination 3 49L. (1) This section shall not apply to any relevant policy (a) which is (i) issued under the Dependants Protection Insurance Scheme established and maintained by the Central Provident Fund Board under section 41 of the Central Provident Fund Act (Cap. 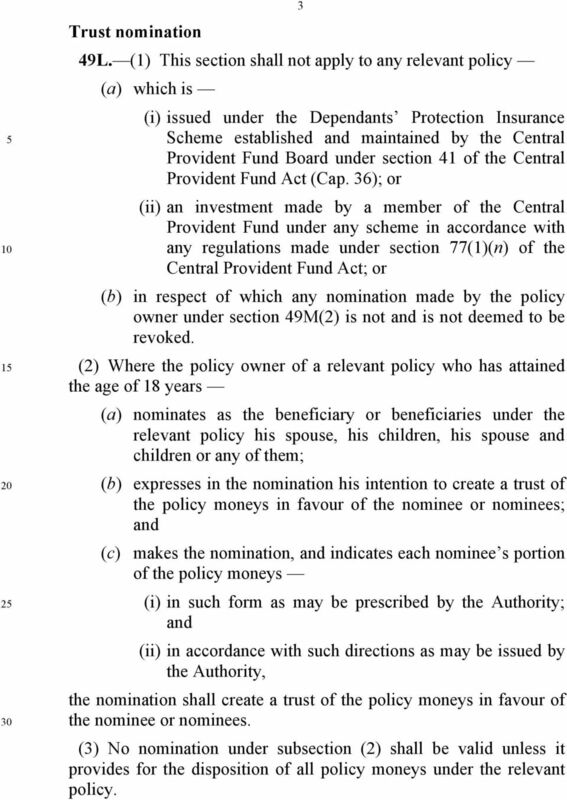 36); or (ii) an investment made by a member of the Central Provident Fund under any scheme in accordance with any regulations made under section 77(1)(n) of the Central Provident Fund Act; or (b) in respect of which any nomination made by the policy owner under section 49M(2) is not and is not deemed to be revoked. 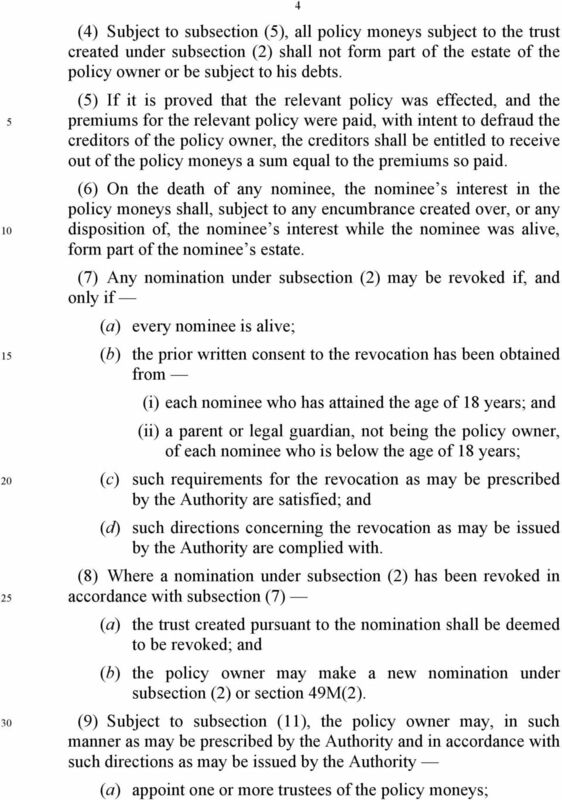 (2) Where the policy owner of a relevant policy who has attained the age of 18 years (a) nominates as the beneficiary or beneficiaries under the relevant policy his spouse, his children, his spouse and children or any of them; (b) expresses in the nomination his intention to create a trust of the policy moneys in favour of the nominee or nominees; and (c) makes the nomination, and indicates each nominee s portion of the policy moneys (i) in such form as may be prescribed by the Authority; and (ii) in accordance with such directions as may be issued by the Authority, the nomination shall create a trust of the policy moneys in favour of the nominee or nominees. (3) No nomination under subsection (2) shall be valid unless it provides for the disposition of all policy moneys under the relevant policy. 8 5 (b) from time to time, appoint one or more new trustees of the policy moneys; and (c) make provision for (i) the appointment of one or more new trustees of the policy moneys; and (ii) the investment of the policy moneys. 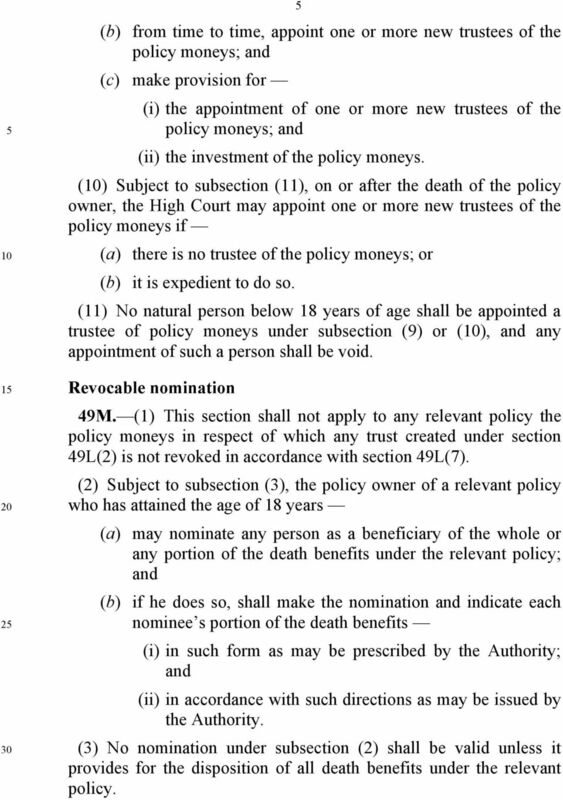 () Subject to subsection (11), on or after the death of the policy owner, the High Court may appoint one or more new trustees of the policy moneys if (a) there is no trustee of the policy moneys; or (b) it is expedient to do so. (11) No natural person below 18 years of age shall be appointed a trustee of policy moneys under subsection (9) or (), and any appointment of such a person shall be void. Revocable nomination 49M. (1) This section shall not apply to any relevant policy the policy moneys in respect of which any trust created under section 49L(2) is not revoked in accordance with section 49L(7). 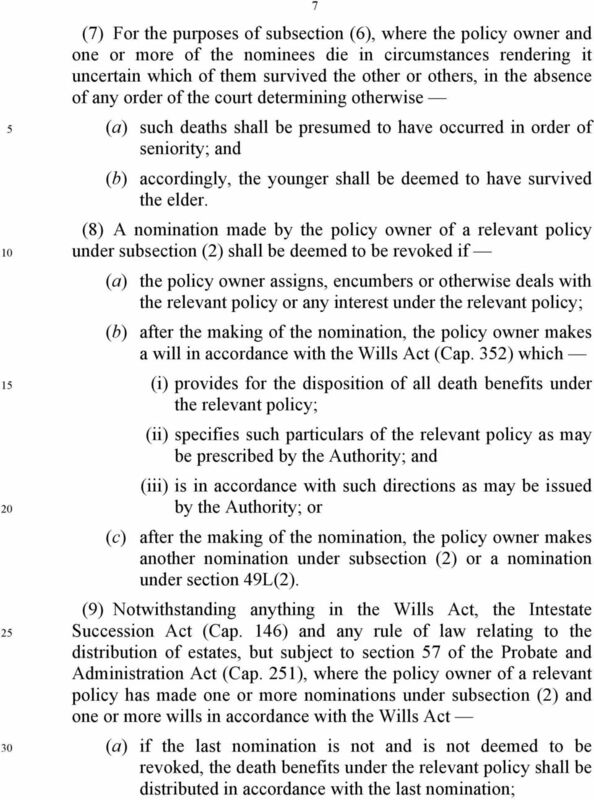 (2) Subject to subsection (3), the policy owner of a relevant policy who has attained the age of 18 years (a) may nominate any person as a beneficiary of the whole or any portion of the death benefits under the relevant policy; and (b) if he does so, shall make the nomination and indicate each nominee s portion of the death benefits (i) in such form as may be prescribed by the Authority; and (ii) in accordance with such directions as may be issued by the Authority. (3) No nomination under subsection (2) shall be valid unless it provides for the disposition of all death benefits under the relevant policy. 9 6 (4) A policy owner may revoke a nomination under subsection (2) at any time (a) in such manner as may be prescribed by the Authority; and (b) in accordance with such directions as may be issued by the Authority. (5) A nomination made by a policy owner under subsection (2) shall not be revoked by his marriage. 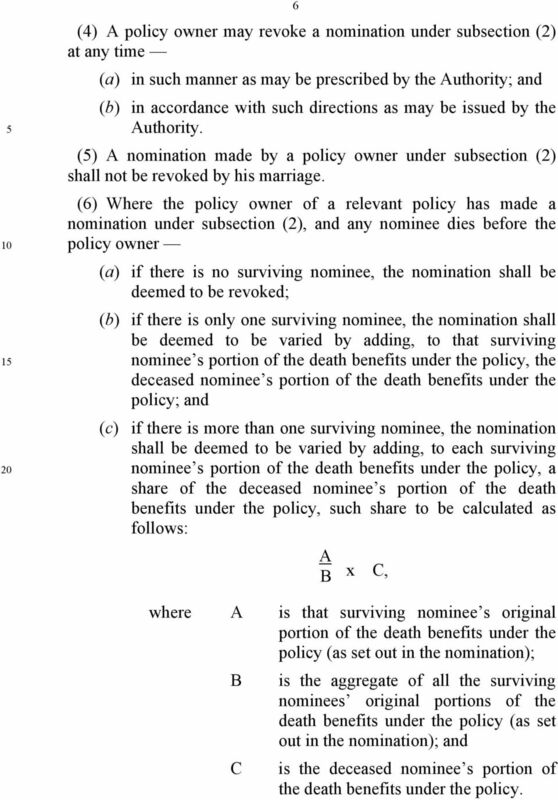 (6) Where the policy owner of a relevant policy has made a nomination under subsection (2), and any nominee dies before the policy owner (a) if there is no surviving nominee, the nomination shall be deemed to be revoked; (b) if there is only one surviving nominee, the nomination shall be deemed to be varied by adding, to that surviving nominee s portion of the death benefits under the policy, the deceased nominee s portion of the death benefits under the policy; and (c) if there is more than one surviving nominee, the nomination shall be deemed to be varied by adding, to each surviving nominee s portion of the death benefits under the policy, a share of the deceased nominee s portion of the death benefits under the policy, such share to be calculated as follows: A B x C, where A is that surviving nominee s original portion of the death benefits under the policy (as set out in the nomination); B is the aggregate of all the surviving nominees original portions of the death benefits under the policy (as set out in the nomination); and C is the deceased nominee s portion of the death benefits under the policy. 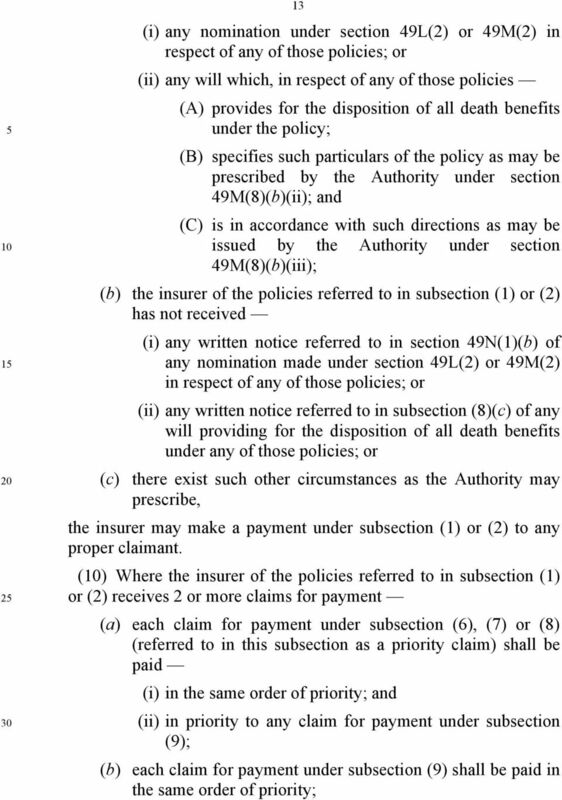 14 11 policies issued by the insurer (such payment or payments not exceeding in the aggregate the amount prescribed by the Authority for the purposes of this subsection) without the death benefits having been included in any schedule or certificate referred to in section 43(2) of that Act. 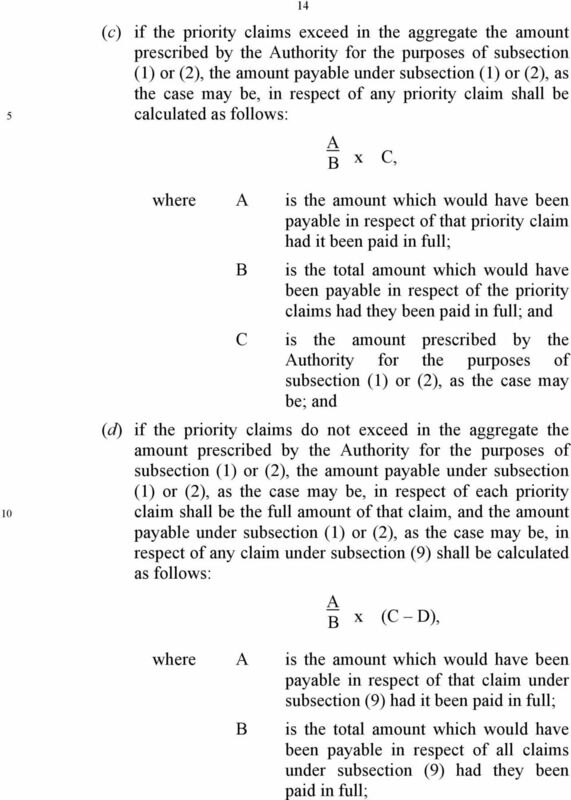 (3) If, as a consequence of making any payment under subsection (2), the aggregate of all payments made under that subsection will exceed the amount prescribed by the Authority for the purposes of this subsection, the insurer shall, before making the first-mentioned payment, give written notice to the Commissioner of Estate Duties of such particulars as the Commissioner may require. 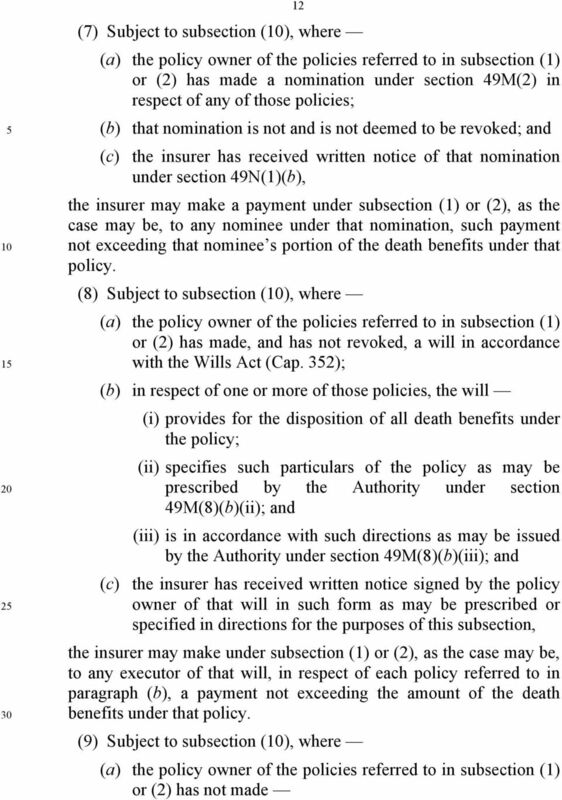 (4) Subsection (2) shall apply in relation to death benefits under policies of which the deceased was not the policy owner at his death as it applies in relation to any death benefits referred to in subsection (1). 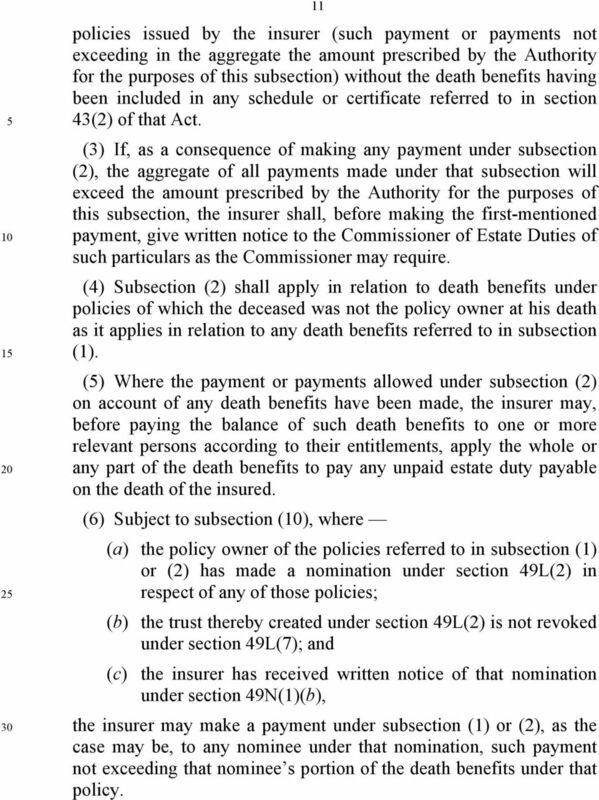 (5) Where the payment or payments allowed under subsection (2) on account of any death benefits have been made, the insurer may, before paying the balance of such death benefits to one or more relevant persons according to their entitlements, apply the whole or any part of the death benefits to pay any unpaid estate duty payable on the death of the insured. (6) Subject to subsection (), where (a) the policy owner of the policies referred to in subsection (1) or (2) has made a nomination under section 49L(2) in respect of any of those policies; (b) the trust thereby created under section 49L(2) is not revoked under section 49L(7); and (c) the insurer has received written notice of that nomination under section 49N(1)(b), the insurer may make a payment under subsection (1) or (2), as the case may be, to any nominee under that nomination, such payment not exceeding that nominee s portion of the death benefits under that policy. 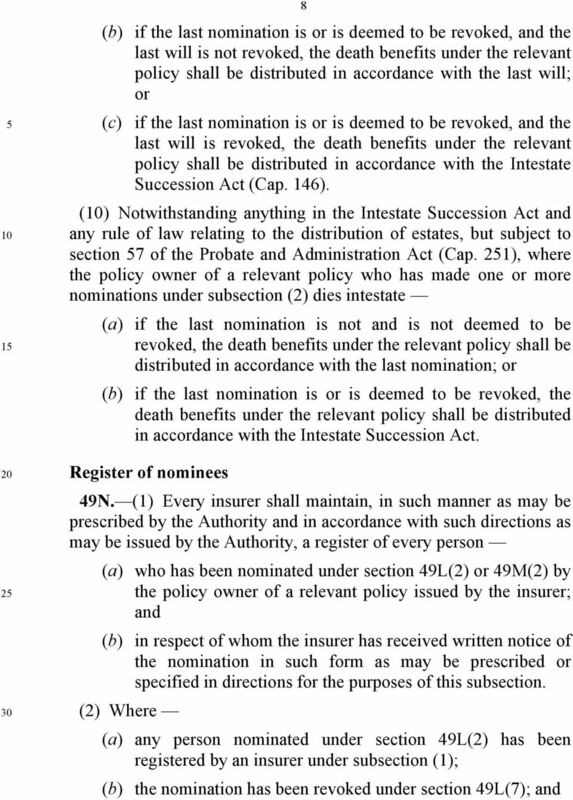 19 16 any nominee under that nomination, in respect only of that nominee s portion of the death benefits under that policy; or (c) any proper claimant, in respect only of the death benefits under every policy referred to in subsection (2) for which (i) no nomination has been made by the deceased under section 49L(2) or 49M(2); or (ii) every nomination made by the deceased under section 49L(2) or 49M(2) is or is deemed to be revoked. (12) In deducing any relationship for the purposes of the definition of proper claimant in subsection (11), an illegitimate person shall be treated as the legitimate child of his actual parents. (13) For the purposes of this section, where any nomination has been or is deemed to be varied, any reference to a nominee under that nomination shall be construed as a reference to a nominee under that nomination as varied.. Amendment of First Schedule 5. 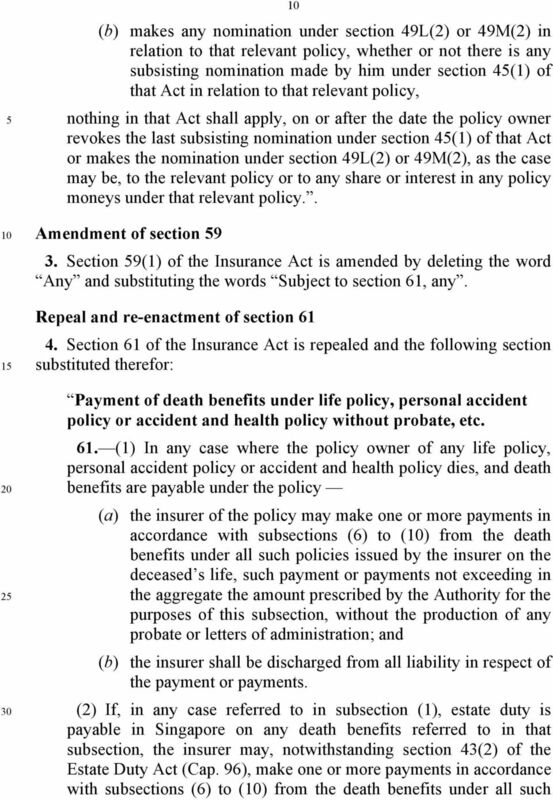 The First Schedule to the Insurance Act is amended (a) by inserting, immediately after paragraph 2, the following paragraph: 2A. Child means a legitimate child, stepchild or child adopted in accordance with any written law relating to the adopting of children. ; and (b) by inserting, immediately after paragraph 4E, the following paragraphs: 4F. Personal accident policy means any policy under which policy moneys are paid out with respect to any loss (not being any loss arising out of a liability to pay compensation or damages) on the occurrence of either or both of the following: (a) in the event of any injury to, or disability of, the insured as a result of any accident; or (b) on the death of the insured by any accident. 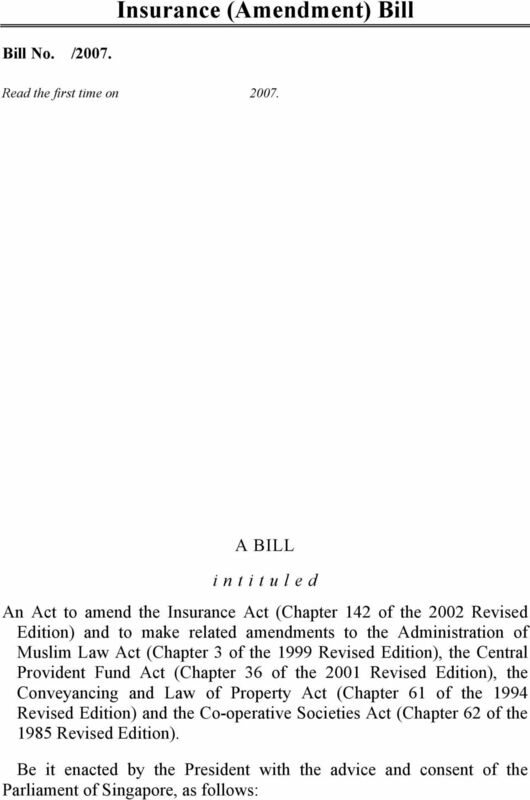 22 19 Insurance Act (Cap. 142) in force immediately before that date shall continue to apply to that case as if section 4 had not been enacted. EXPLANATORY STATEMENT This Bill seeks to amend the Insurance Act (Cap. 142) to introduce a new statutory framework for the nomination of beneficiaries under a relevant life policy or personal accident policy which is effected by the policy owner on his own life (relevant policy). The new statutory framework does not apply to any life policy or personal accident policy (a) in respect of which any trust has been created under section 73 of the Conveyancing and Law of Property Act (Cap. 61); or (b) which is an annuity purchased with the minimum sum under section (6C) of the Central Provident Fund Act (Cap. 36). The Bill also seeks to make related amendments to sections 59 and 61 of, and the First Schedule to, the Insurance Act, and to the Administration of Muslim Law Act (Cap. 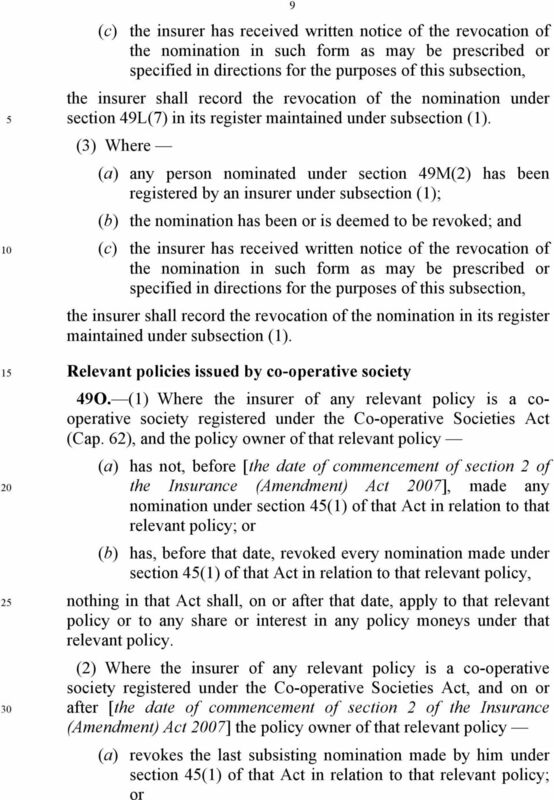 3), the Central Provident Fund Act, the Conveyancing and Law of Property Act and the Co-operative Societies Act (Cap. 62). Clause 1 relates to the short title and commencement. Clause 2 inserts a new Part IIIC (comprising new sections 49K, 49L, 49M, 49N and 49O) to provide for the new statutory framework. The new section 49K defines certain terms used in the new Part IIIC. 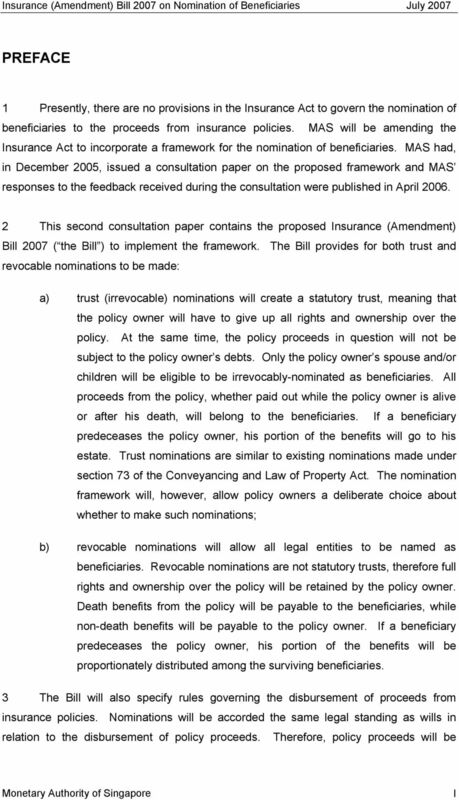 The new section 49L enables the policy owner of a relevant policy to nominate one or more of his spouse and children as the beneficiary or beneficiaries under the policy, and to thereby create a trust of the policy moneys in favour of the nominee or nominees, if certain conditions specified in the section are satisfied. A nomination made under the section, and the trust thereby created, may be revoked only with the prior written consent to the revocation of (a) each nominee who has attained the age of 18 years; and (b) a parent or legal guardian, not being the policy owner, of each nominee who has not attained the age of 18 years. The new section 49M provides for the policy owner of a relevant policy to nominate any person as a beneficiary of the whole or any portion of the death benefits under the policy, if certain conditions specified in the section are satisfied. 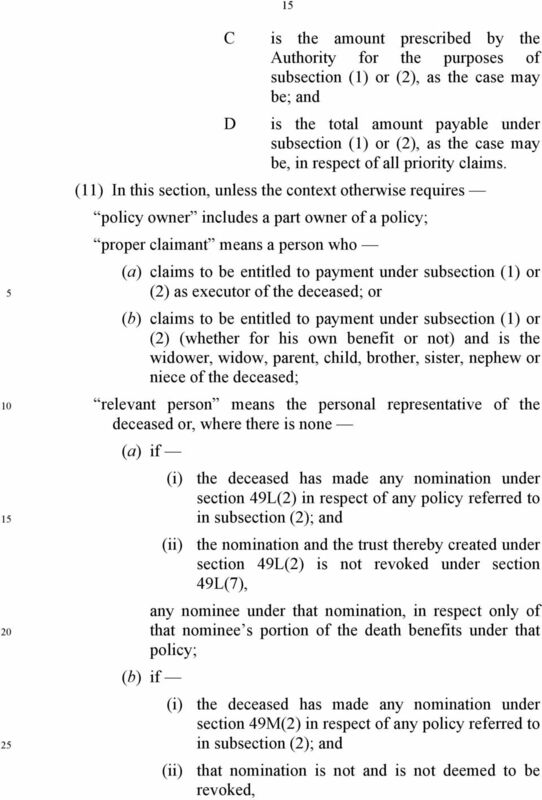 No trust is created by a nomination under this section, even if the nominee is the spouse or a child of the policy owner. The policy owner may, at any time, revoke a nomination made under the section. Bill No. 18/11. Work Injury Compensation (Amendment) Bill Read the first time on 17th October 11. A BILL intituled An Act to amend the Work Injury Compensation Act (Chapter 34 of the 09 Revised Edition). PLEASE NOTE This document, prepared by the Legislative Counsel Office, is an office consolidation of this Act, current to December 19, 2009. It is intended for information and reference purposes only. CHAPTER 81. LAWS OF WISCONSIN-CH. 81 121. No. 52, S.] [Published May 9, 1941. THE AGE OF MAJORITY ACT. eighteen. 3. Time at which a person attains a particular age. 4. Persons under full age may be described as minor. Pension death benefits discretionary trust. R MetLife Discretionary Gift Trust Important Information This document is provided on the strict understanding that it is presented as a draft to be considered by the Settlor and his/her legal advisers. CHAPTER 428 AN ACT concerning retirement benefits for members of the Police and Firemen's Retirement System of New Jersey, amending various parts of the statutory law and supplementing P.L.1944, c.255. MICHIGAN STATUTORY WILL NOTICE. 1. Any person age 18 or older and of sound mind may sign a Will. Internal Revenue Code Section 671 Trust income, deductions, and credits attributable to grantors and others as substantial owners. [CH.71 1 CHAPTER 71 ARRANGEMENT OF SECTIONS SECTION 1. Short title. 2. Interpretation. 3. Action maintainable notwithstanding death of person injured. 4. Persons for whose benefit action may be brought. Probate Act CHAPTER 31 OF THE ACTS OF 2000 as amended by 2001, c. 5, ss. 12-33; 2002, c. 5, s. 47; 2004, c. 3, s. 31; 2007, c. 9, s. 35; 2007, c. 50; 2009, c. 5, s. 26; 2011, c. 8, s. 20; 2013, c. 3, s.